Mankind is a late-medieval morality play, dating from the latter half of the fifteenth century. 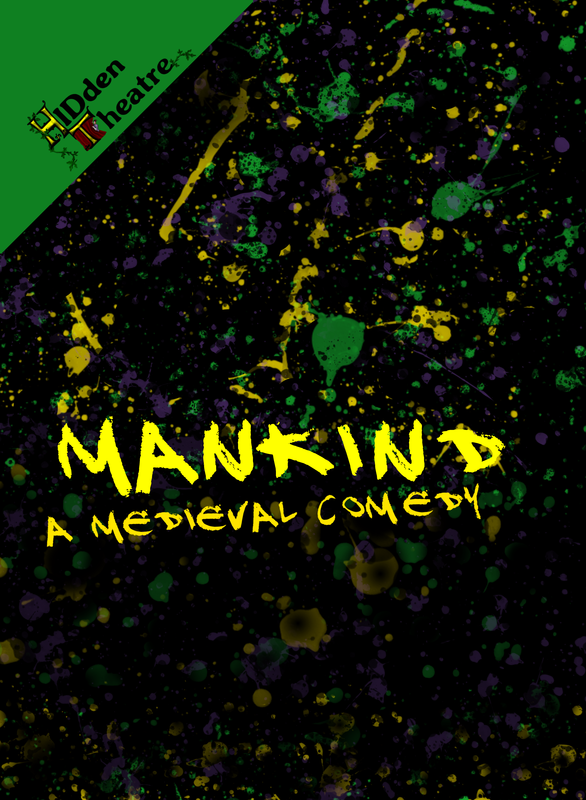 Unlike most other plays of this type, Mankind is less concerned with Man’s journey toward death, and focuses on how one should live a good life. The eponymous Mankind, an industrious but poor man, spends his days working in his fields and attempting to live by the precepts of his friend and father-confessor, Mercy. He is tempted away from this path of virtue, however, by the arrival of a pair of worldly Vices, under the leadership of Mischief and the demon Titivillus, and into a life of lechery and debauchery. It takes the steadfast kindness and forgiveness of Mercy to help him see the error of his ways. Following our experimental staged reading of the play in Bristol in February, we wanted to give the play a full staging. Updating Mankind to the modern era, we tried to find ways of reflecting our own ‘vices’- reliance on technology, a desire to be trendy and fit in, and a decidedly ambivalent attitude to our own mortality. Like Mankind, it is easy to understand the frustration of hard work leading to limited success, and the temptation of prioritising life’s certain pleasures. Hopefully we, like Mankind, can try to seek a balance between the various aspects of our existence, remaining true to the friends who support us through all circumstances, and not be distracted by the passing fancies which offer no lasting substance. Philip Massey (Nought) has a background in theatre and musical theatre from an early age, including playing Hamlet when he was 17 years old. A member of the National Youth and Youth Music Theatre, he has also played various Shakespearean roles, including Benedick in Much Ado About Nothing whist in Madrid. He is a prominent member of the Madrid Players of Madrid, Spain. Philip is a keen singer and has two young sons. Jess Murray (Mankind) studied theatre at York St John University where, alongside her course, she performed, wrote, and directed for the York St John Drama Society. She also performed in the 2010 Waggon Plays with York St John. Jess has worked with Pilot Theatre on Blood + Chocolate and In Fog and Falling Snow and with the York Settlement Community Players on the 2014 Waggon Plays and The Cherry Orchard. She also works on theatre based projects with the Jorvik group. Kate Thomas (Mischief) has previously been involved in HIDden’s performance of The Baptism of Christ (2014 York Mystery Plays) and in numerous productions with York’s Lords of Misrule. She has performed in a number of choral societies, and in 2011 took part in a research project at the University of York investigating the auditory qualities of the York Mystery Plays in the Middle Ages. James Witchwood (New-Guise) is originally from Hull and came to York in 2007 to study archaeology and there became involved in medieval theatre with the Lords of Misrule, his first show, Apollonius of Tyre, being directed by HIDden’s Laura Elizabeth Rice. When not on stage, James plays the fiddle at various sessions around York and leads guided tours of the city’s darker aspects with the York Terror Trail. Theatre credits include: The Cherry Orchard, Drums in the Night, A Christmas Carol, The Stepmother, The Three Musketeers, York Mystery Plays 2010 and 2014, Appollonius of Tyre. Film credits: When the Chips Are Down.